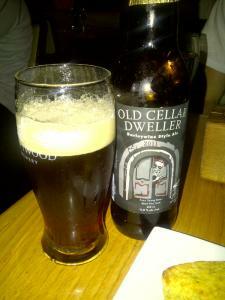 From Victoria BC’s Driftwood Brewing comes the “Old Cellar Dweller Barleywine Style Ale 2012″. This is a Winter 2012 Vintage opened up soon after release. The beer pours a deep amber colour with an off white head. The aroma of this beer consists of dark fruits such as plum, spices, molasses, nuts, hops, malts but not very sweet. The flavour consisted of dark fruits, molasses, some spices and sweetness, huge hops bitterness and a pretty decent boozy kick. This brew has a medium body and a very light carbonation. The alcohol content of this beer is 11.8% with an IBU of 75. Like most barleywines it is always good to lay them down for at least one year. Commercial Description: Three times the malt bill and five times the hops of a normal strength beer, this Barleywine tests the limits of our brewhouse and our backs! But the real struggle is in getting this massive brew to completely ferment, a true test of our skill and the vigor of our yeast. Consisting of 98% Pale Malt (with a bag of CaraMunch thrown in for color) and just one hop variety, Columbus, this beer showcases these two basic ingredients in their most concentrated state. Enjoy this very special beer young, but save a few bottles for future winters. Enjoy not too cold, say about 13C! Barleywine will age indefinitely, like wine; thus the name. Driftwood Brewing recommends food pairings as follows: Rouquefort, Gorgonzola and washed-rind cheeses like Oka or Port de Salut, Dried fruits, and sweet nuts such as Brazils. This beer was part of Mikes Craft Beer’s Barleywine Tasting. It was highly regarded by all tasters involved. This entry was posted in Barleywine Ale, Imperial and tagged alcohol, barleywine tasting, bc, beer, bitter, bitterness, booze, boozy, canada, dark fruit, dark fruits, driftwood brewery, driftwood brewing, fruit, fruits, hops, hopy, molasses, nuts, old cellar dweller, plum, semi sweet, spice, spices, tasting, victoria.